Come along with us for a somewhat quirky tour of Hollywood, California. 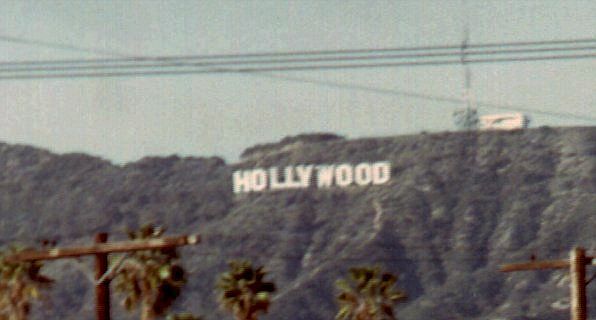 Outside of Los Angeles, Hollywood is generally known for being the center of the movie industry, but here it is known more for having a high crime rate and general sleaze. The actual reality of the place is quite different. The first stop is the famous Mann's Chinese Theater, which is where the hand and footprints of the stars are frozen in the concrete in front of the main theater. This is also along the "Walk of Fame", which is the bronze stars set in the sidewalk, commemorating various movie, television, and recording stars. Many of the stars are for people who are largely forgotten, but they also include many recent stars, as well as some that are still famous. Probably my favorite single star is the one for Thomas Edison, for his invention of the motion picture and the phonograph, which made much of modern Hollywood possible. In addition, there are a couple of stars for animated cartoon characters. About three or four doors west of the theater is the star for Bugs Bunny. Here we see the man who provided the voice of Bugs, along with his character at the ceremony for the dedication of the star in January, 1986. This is the only star ceremony I've ever gone to. Going to the corner just east of the theater brings us to the starting point for Grave Line Tours, which is the only `tour of the stars' we have ever taken. Passengers ride around Hollywood in a hearse and get a tour of the places where the stars died. Stops include the motel where Janis Joplin died, the alley where Sal Mineo was knifed, and the cottage where John Belushi overdosed. It's a unique view, and they also pass out a map to the cemetary, so `you can get within 6 feet of your favorite star.' 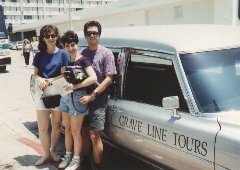 Sadly, Grave Line Tours is no more, but you can read a lot of the same stories at the owner's web site. 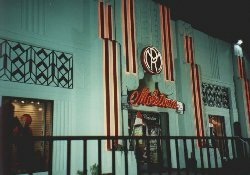 Just a few blocks away on Highland Avenue is the former Max Factor building, which used to house the Makeup Museum, which gave an interesting history of makeup and costuming for movies and television. Unfortunately, when Max Factor was bought out by another cosmetics company, they didn't see fit to preserve this particular bit of local history. But the Max Factor collection now resides just around the corner, in the Hollywood Entertainment Museum. Across the street from the Chinese Theater is the historic Hollywood Roosevelt Hotel, which until recently had a pool painted by artist David Hockney. 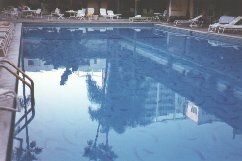 At the time when this was done, back in the mid-1980s, the hotel had to apply for a special variance from the city to be allowed to have a pool painted with something other than the standard pool paint. If we travel about a half-mile southwest, to La Brea Avenue, just a bit south of Santa Monica Boulevard, we come to Moletown. This opened during the time when we were living just a few blocks away, and we were intrigued. We thought, "What the hell is Moletown?" It turns out that Mole-Richardson is a company that provides lights and `consumables', meaning things like sandbags and duct tape to the studios. They decided to branch out into consumer items, and opened this store, which deals in movie and TV memorabilia and other entertainment industry trinkets. They also have a display of movie lights in the store, so you can see close up just how hot your favorite star feels when he or she is lit up on the set. Finally, let's stop at the parking lot next to The Palace for a look at some Hollywood history. 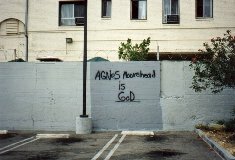 Who could argue that Agnes Moorehead is not God?